This recipe is one of our favourites. 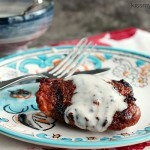 I have two signature kebab recipes I make when family and friends visit. This is one of them. This is a grill recipe I’ve been making for years. It really has become one of my signature dishes. Sometimes I change up the marinade, or I may glaze it with something different but the basic idea is always the same. What I dig about this recipe is it’s easy. You don’t have a million steps to get to the end result. It’s also quick. If you have time to marinate that’s fabulous. If you don’t they will still be freaking amazing. I also love the fact that it’s a rather quick recipe. Low and slow is great but some days I don’t have time to babysit the grill or smoker all the live long day. While doing so is totally worth it, I have a bit of a hectic life with kids, and pets, and Netflix all biding for my time. 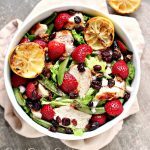 This recipe is incredibly quick, wicked easy and so freaking packed with flavour you may lose your mind a little bit. It’s okay though. Some recipes are worth it. This is one of them. I know right. You just want to sink your teeth into that piece with the char on the corner. But you can’t. Because I already did. Sorry about that. You snooze, you lose around here. Do not be afraid of char. I grew up with a father who hated to see any black on food, he also hated any pink inside his beef. Which made my mom’s job really difficult. I used to be terrified of the dark bits. Now I know that’s where the flavour is. I’ll knock you on your arse to get the best piece of char. It’s how I roll. Soak your wooden skewers before using them. Soaking for an hours is very helpful. Don’t crowd the ingredients. They cook better if you leave a wee bit of room between ingredients. Marinating can make a bit difference. If you don’t have time to marinate be sure to season and sauce as you cook. Don’t overcook them but do add a touch of char. Those little dark bits are best part. Keep a close eye on kebabs. They tend to cook rather quickly so don’t wander away from your grill! 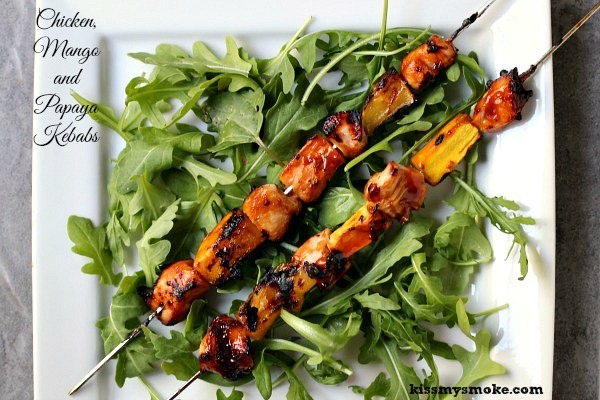 If using wooden skewers soak them for at least 30 minutes, or up to an hour. Cut the chicken breasts into cubes, making sure they are all about the same size for even cooking. Place the chicken pieces in a large ziploc bag and pour in the tamari sauce. Seal the bag properly, then give it a shake. Marinate in the fridge for about an hour if you have time. If not, just give it a quick one while you preheat the grill and prep the other ingredients. Even 20 minutes is good. Cut up the fruit so the pieces are about the same size as the chicken you cut previously. Place each fruit in a bowl and set aside. 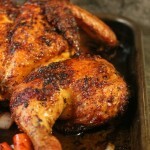 Remove the chicken from the fridge about 20 minutes before you want to place it on the grill, 30 minutes is ideal. Cooking cold meat is never a wise idea. 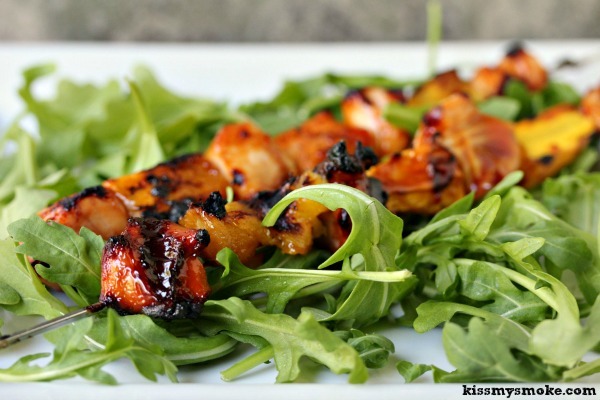 Discard marinade and place the chicken on a plate or platter while you get ready to load the skewers. 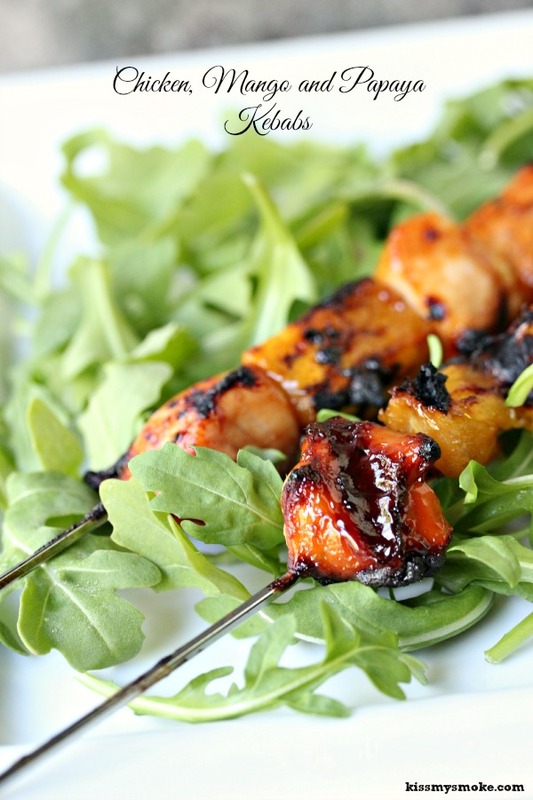 Start laying your chicken and fruit on the skewers in any order you like. It's okay to have fun with this part. 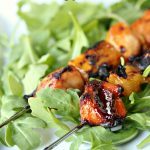 If you are worried about meat being on the same skewer as fruit you can do each item on separate skewers. Whatever floats your boat. 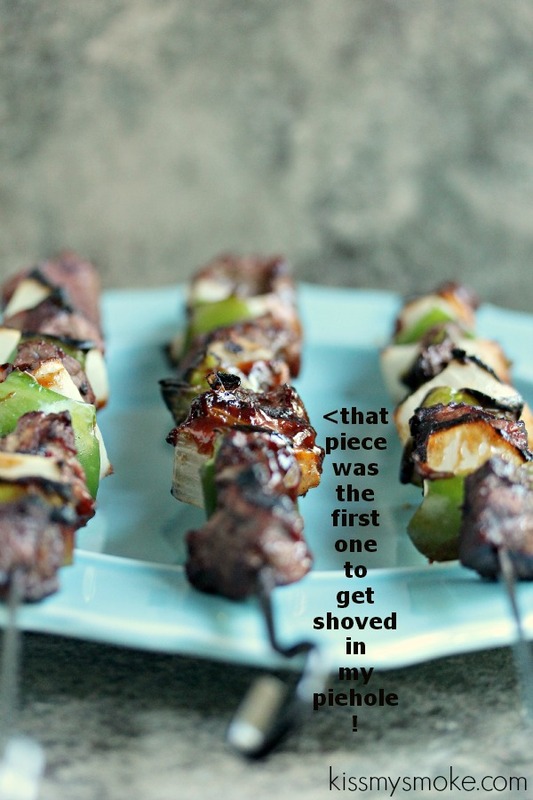 If you layer them all on the same skewer remember not to pack them too tightly onto the skewer. You want there to be a small gap between ingredients so the food cooks thoroughly. Place the remaining half of the tamari sauce in 3 small bowls, and be sure to bring grill brushes out with you. I tend to be super careful with poultry, try not to cross contaminate things. Use a different brush each time you coat these. I buy cheap brushes at the dollar store for stuff like this, or you can find really inexpensive brushes at your local hardware. I buy those little wooden ones for painting and use those for things like this. You can just pour from the bottle too. Helps avoid any cross contamination when dealing with poultry. I also recommend bringing out 1/4 cup of vegetable oil (just cheap stuff for this) in a dish and a brush for that as well. You want to carefully brush the oil on the grill grates before putting the food on the grill. This helps tremendously with cooking on the grill and not having your food stick. Another tip is to make sure your grill grates are clean, it makes a huge difference when cooking. Less sticky, less aggravation, better food. I also brush a little oil over the kebabs just before they go on the grill. Not a lot, just a touch. Place the kebabs on the grill, brush with tamari sauce, close the lid and cook for about 3 to 5 minutes. Open up the lid, and flip the kebabs over. 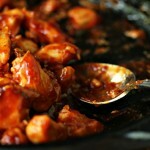 Brush some tamari sauce on, close the lid and allow to cook for another 2 to 4 minutes. Remove the kebabs and brush with a bit more tamari sauce. Coat them evenly on all sides. Serve with a big old kebab-loving smile! 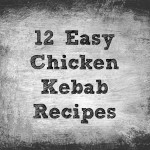 I shared a version of this Fruity Chicken Kebab Recipe years ago on my other blog, Cravings of a Lunatic. It's been in regular rotation in our household for years. We love this one. What is incredibly cool with this recipe is if you make extra, or have leftovers this makes an incredible stir fry. I'll be sharing the recipe for my favourite stir fry using leftover kebabs soon. You will flip out when you see this one. It's legendary among my family and friends. 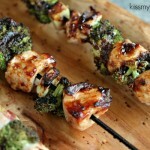 Follow Kiss my Smoke’s board * Kiss My Smoke Recipes * on Pinterest! Hope you love this recipe. I’ll be sharing my recipe for Chicken, Coconut, and Pineapple Kebabs this week as well. They are my personal favourite. Yes, you can grill coconut, and you should. Constantly. Trust me. 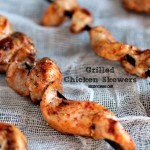 Looks amazing Kim – I love kebabs, but have just know gotten into making them myself on my Weber charcoal grill. Will definitely try these! Thanks Martin. This is one of our absolute favourite recipes. We make it a couple of times a year. It’s a classic at this point. Mmmm with summer still here, these may need to happen! You should totally try them. I’m one of those wacky people who grills year round. Even in the snow. I am new to grilling and am teaching myself and loving it! I need to give kebabs a try!! Love these flavors! The mango and papaya take it to the next level! Thanks so much Julia. 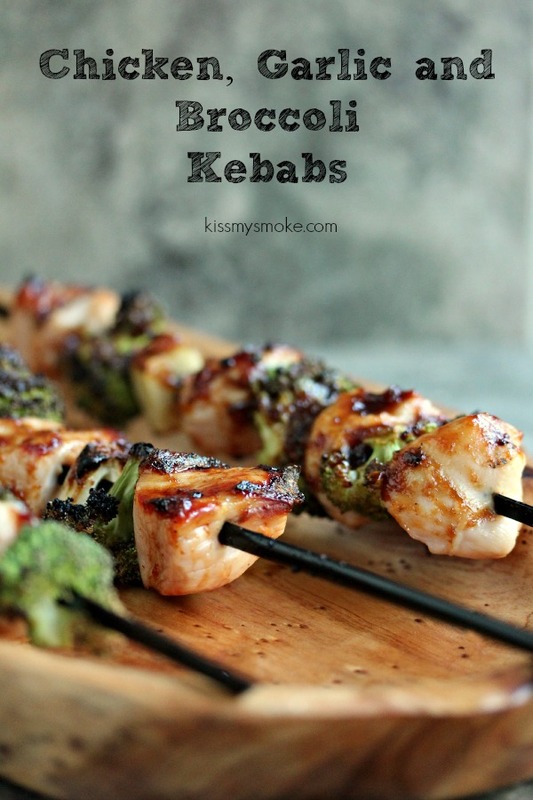 We love these kebabs.